Belfast boxer Michael Conlan guaranteed himself at least a bronze medal at the European Championships in Bulgaria as he won his quarter-final on Wednesday. 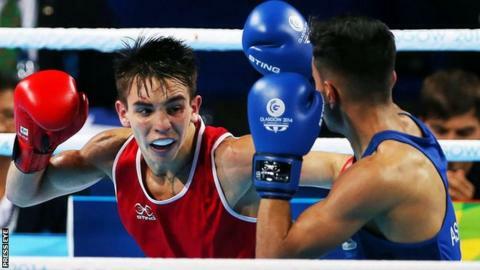 Olympic bronze medallist Conlan secured a dominant points victory over Denmark's Frederick Jensen in their bantamweight last-eight bout. The Belfast man's team-mates Dean Walsh and Joe Ward have also guaranteed themselves medals in Samokov. However, Adam Nolan's medal hopes were dashed when he was edged out by Belarus's Pavel Kastramin in a tight welterweight quarter-final. Wexford man Nolan had produced the performance of his career to beat Russia's number one seed Radzhab Butaev in the last 16 on Tuesday. Nolan's fellow Wexford man Walsh, the nephew of Irish trainer Billy Walsh, edged out Hungary's Georgian Nyeki in a tight light-welterweight contest to secure his first major international medal. Walsh, 21, will fight Russian Vitaly Dunaytsev in the semi-finals on Friday. Light-heavyweight Ward beat Belarussian Mikhail Dauhaliavets in his quarter-final. Conlan, 23, won flyweight bronze at the London Olympics in 2012 and he has already booked a bantamweight berth at next year's Rio Games. In Wednesday's bout, Conlan's southpaw stance appeared to outfox the Dane in the first round before the Belfast man began to land some big punches in the second session. Jensen attempted to rally in the final round but only succeeded in slipping to the canvas on two occasions as Conlan completed a 30-27 win on all three cards. Conlan's win, which sets up a semi-final with Italy's Francesco Maietta on Friday evening, also books his place at the World Championships in Qatar in October. Speaking on Twitter after his win on Wednesday, Conlan made clear his confidence that he will secure a first European Championship gold this weekend. "Box Friday in the semis against Italy. Looking forward to getting another win. On my way to gold," said the 23-year-old.